It is not necessary to go to the extreme to point out President Obama's short coming. This bill board is certain to draw objections from a broad spectrum of Americans. He is still our president and the office requires respect. Thankfully the error was recognized and the billboard was removed immediately. 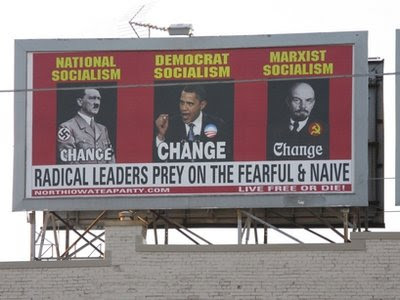 A billboard that showed Obama's many failures as an American would be so much more effective, in my opinion. 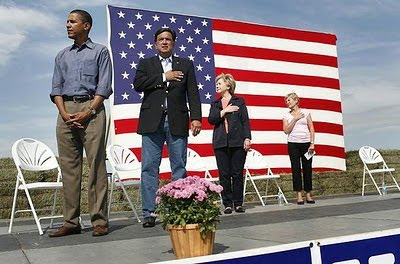 My favorite is this picture that shows him being disrespectful during the Pledge of Allegiance to our flag. WHAT AN EFFECTIVE BILLBOARD THIS WOULD BE! Maybe a picture of him bowing deeply to the Arab King or the Japanese leader after having being rude to the Queen of England. Know the truth and speak it freely! The truth will set us free. I have that on very good authority. I have seen the picture of President Obama without his hand to his heart in many of your blogs. And it has me asking questions. #1 Is it possible that this wasn't the Pledge of Allegiance - where such lack of holding one's hand to heart would be egregious, but possibly instead the singing of the National Anthem? I'm pretty certain that not everyone salutes or holds their hands to their hearts during the National Anthem. I could be wrong. I know at ball games I always take my hat off in respect, but I don't remember everyone in the stadium placing their hand over their heart. It might be worth researching. I think there may actually be a video of it on YouTube.com. Would it matter to you if it were the National Anthem and not the Pledge of Allegiance? #2 - Is it possible that President Obama being on the far left (physically, not politically) and looking away from the others on the stand and looking away from the flag, simply didn't realize that others (all candidates) were holding their hands to their hearts. What about the other people that then Candidate Obama could see that we cannot in the photo. Is it possible that no one else he could see had their hands to their hearts? #4 - Is this an ongoing habit of our President? Are there many other examples of such behavior? Or was this a one time event, which his enemies play over and over again? Having seen the same kind of one-time, out of character picture or video clip used against President Bush as a political weapon, I'm hesitant to jump to the conclusion that this is our President's normal character. Dad, I'm willing to be educated on this. I'll be interested to learn what you find out. Until then I think I'll continue to give President Obama the benefit of the doubt.